Aqueous buffered solution containing BSA and ≤0.09% sodium azide. The LpMab-17 monoclonal antibody specifically recognizes human podoplanin which is encoded by PDPN. Podoplanin is a 38-44 kDa type I transmembrane glycoprotein. This heavily glycosylated mucin type protein is named for its expression on kidney glomerular epithelial cells known as podocytes. It is also expressed on a wide variety of cell types, including intestinal and thymic epithelial cells, alveolar type I cells, fibroblastic reticular cells, lymphatic endothelial cells, osteoblasts, and Th17 cells. Its expression is upregulated in some tumors. Podoplanin induces platelet aggregation via its three platelet aggregation-stimulating (PLAG) domains; it binds C-type lectin domain family 1 member B (Clec1B, also known as CLEC2); and it is involved in actin cytoskeleton organization and in cellular adhesion and migration. It also plays roles in organogenesis, vascular development, inflammatory diseases, tumorigenesis, and cancer cell motility and metastasis. The antibody was conjugated to BD Horizon BV421 which is part of the BD Horizon Brilliant™ Violet family of dyes. With an Ex Max of 407-nm and Em Max at 421-nm, BD Horizon BV421 can be excited by the violet laser and detected in the standard Pacific Blue™ filter set (eg, 450/50-nm filter). BD Horizon BV421 conjugates are very bright, often exhibiting a 10 fold improvement in brightness compared to Pacific Blue conjugates. BV421 is a polymer-based dye excited by the violet laser and is one of the brightest fluorochromes offered by BD Biosciences. Conjugates are typically 10 times brighter than Pacific Blue™ conjugates and are often as bright as or brighter than PE conjugates. 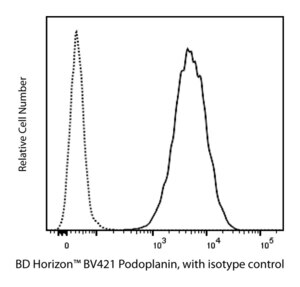 Due to nearly identical excitation and emission properties but different spillover characteristics, BD Horizon BV421, Pacific Blue™, and BD Horizon™ V450 cannot be used simultaneously. Store undiluted at 4°C and protected from prolonged exposure to light. Do not freeze. The monoclonal antibody was purified from tissue culture supernatant or ascites by affinity chromatography. The antibody was conjugated with BD Horizon BV421 under optimum conditions, and unconjugated antibody and free BD Horizon BV421 were removed. Source of all serum proteins is from USDA inspected abattoirs located in the United States. Pacific Blue™ is a trademark of Molecular Probes, Inc., Eugene, OR. BD Horizon Brilliant Violet 421 is covered by one or more of the following US patents: 8,158,444; 8,362,193; 8,575,303; 8,354,239. DRAQ5™ is a registered trademark of BioStatus Ltd.
For optimal and reproducible results, BD Horizon Brilliant Stain Buffer should be used anytime two or more BD Horizon Brilliant dyes (including BD Optibuild Brilliant reagents) are used in the same experiment. Fluorescent dye interactions may cause staining artifacts which may affect data interpretation. The BD Horizon Brilliant Stain Buffer was designed to minimize these interactions. More information can be found in the Technical Data Sheet of the BD Horizon Brilliant Stain Buffer (Cat. No. 563794/566349) or the BD Horizon Brilliant Stain Buffer Plus (Cat. No. 566385).